The Moluccan Cockatoo has a reputation for being very playful, and considered by many to be among the most intelligent and responsive of all cockatoos. Their beaks, however, are capable of cutting into young coconuts and can inflict serious injuries should they be denied constant affection. Similar in structure to the beak, pliers can be extremely helpful while also demonstrating strength. 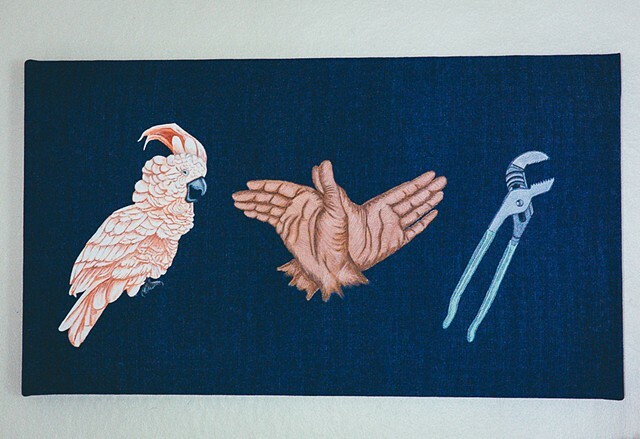 A pair of hands in the configuration of a shadow bird, bridges the animal and tool comparison by exhibiting the limb that makes a pair of pliers operate can dually entertain the playful bird that the pliers embody.